Thursday Phelan, Andy and Vinny in an abandoned paper mill somewhere. Phelan’s handgun. Time to shoot or be shot. Tense, dramatic. And so long overdue that I just didn’t care. Just please shoot somebody, anybody, so this can finally end! Phelan forces Andy to shoot Vinny. Andy turns the gun on Pat, but crumbles and hands it back. Phelan then shoots Andy. We don’t see that, just hear the shot while seeing the outside of the mill. We see Phelan dump the bodies in a pond, then walk through the rain to his van. Back behind the wheel, he watches his hands tremble. Of course, the shootings won’t end the storyline. The whole thing will have to come out, and Phelan be caught. I am not looking forward to it. I’m even thinking about how much time Coronation Street consumes in my life. And wondering if that time could be better spent. The scenes with Andy and Vinny in the cellar and the van were great. It crossed my mind that add a bit to them and you would have a great short play. But a good Corrie? Not for me. The basement business went on too long. I’d come to dread seeing those stairs or that lightbuib. Please, no, I don’t wanna go down there again! Pat Phelan is a wonderful character and Connor McIntyre is brilliant at portraying his many sides. So I can sympathize with the writers’ problem. They have created a great character and fan favourite. But he is a villain. He cannot switch to being Nice Pat and just go on living on the street. He must have his comeuppance. I don’t know how long that’s going to take. Or how much more convoluted it’s going to get. Too long, too much, I suspect. It would be ok with me if they just did a “Dallas“ on Phelan and have it all be a dream. He or Eileen would wake up and say “what a horrible dream I had. I was (you were) a really clever conman who ripped off a whole lot of people and held nice Andy prisoner for a year then killed him and my (your) evil partner Vinny. Wow, won’t they get a good laugh when I tell them!” There, problem solved. Phelan goes into a dark, dingy cellar at the end of Monday’s episode. He carries a grocery bag. He pulls out a box of chocolate eclairs. He’s talking to someone, telling them how nice it is of him to bring them food, to look after them. Then he eats the eclair. The eclair reminds him of his mum, his childhood. She sometimes would buy a few chocolate eclairs from the posh bakery. They, and what they represented, made him want the good things in life. He found the easiest way to get them, however, was by doing bad things. Without saying whether he’s choosing the left or the right path, he heads back up the stairs. Does he toss the food within reach of the person in the room? Or does he take it with him? Don’t know. Andy was trying to get away, packing a bag as fast as he could. But Phelan caught him and clunked him over the head with a laptop. We haven’t known if he was dead or alive. Alive, and not actually looking that much worse for wear after eight months of being chained to a wall in a cellar. No light. No room to move. Phelan brings food, but it seems he also eats it while telling Andy how very delicious it is. I’m of two minds about this story. What happened to Andy had to be resolved at some point. Six months earlier would have been better. By now, it’s almost like an American soap where somebody miraculously returns from the dead with whatever silly explanation is deemed to test audience incredulity the least. Phelan has to be caught. He must pay for his misdeeds. But I like Phelan, and he’s been edgy but good Phelan for long enough now that I’m willing for him to just continue that way. I’m not buying the story, but I loved the scene. It was a glimpse into Phelan’s mind and soul. You could almost see that little boy, and his anticipation when he saw his mother come home with the posh bakery box. Chocolate eclairs – a delicious treat and the good life. A dream sequence Tuesday, first time I’ve ever seen that on Corrie! It was well done, but I hope it doesn’t get repeated. I have always liked that fact that on Coronation Street viewers and characters see the same ‘reality’. Departing so far from the show’s style by showing viewers Andy’s dream? I don’t think so. Doing something like that, if deemed advisable at all, should be reserved for landmark events in the history of the show or long-established characters. Andy and Phelan’s story of villainy and bullying, in my mind, does not qualify. While I like the actors and their characters, I don’t have enough invested in them or their story to suspend disbelief that much. Instead of feeling emotionally caught up in the dream sequence, my mind immediately connected it to the use of incidental music that we have seen lately. Music playing throughout multiple scenes like a movie score, and therefore not conveying realism of a scene. 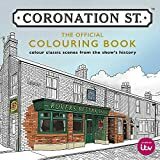 The music in Coronation Street, with rare and again momentous exceptions, always fits with, and derives from, a particular setting. Another “innovation” for Coronation Street, we’ve seen musical overlay too much already in my opinion. Music and dream as conveyors of interior emotion are not innovations in the world of soaps. American daytime serials have long and extensively used both. One of the very good things about Coronation Street has always been that they didn’t use them. We the viewers were eavesdropping on the lives of the characters, we weren’t entering into their minds. The saving grace with seeing Andy’s dream was that it wasn’t shot in soft focus. But it wouldn’t be, would it? This was a nightmare, so it should be in stark relief. It was, and as the opening scene of the episode, it was effective. Visually, I loved it! It’s a small street, Phelan and his actions are larger than life. His time for getting away with villainy must be running out.